It’s almost the official beginning of summer at the time of this post today, which means grill season! 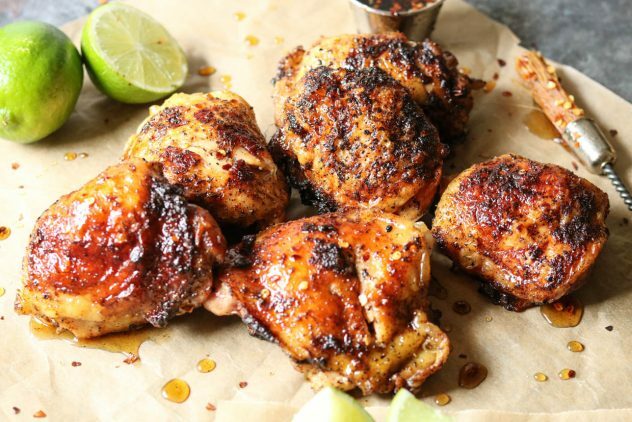 These honey lime chicken thighs are grilled to perfection while the honey lime sauce brings a sweet, zesty flavor with a hint of heat. But who am I kidding, we tend to grill year round if we can. I love grilling in the summer because it’s so much quicker and easier plus no hot kitchen. 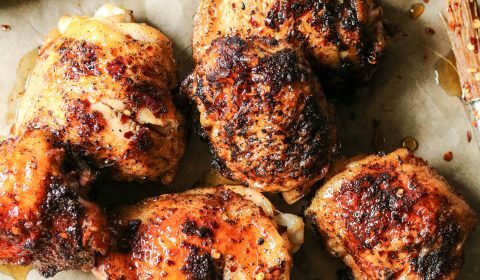 For this recipe, I used bone-in chicken thighs with skin. I find that the skin really soaks up the flavor of both the chicken and the sauce. You could, however, do boneless, skinless chicken thighs or even chicken breasts if you prefer. I use liquid aminos rather than soy sauce these days, and the aminos in this sauce recipe really help bring out the zesty lime flavors. My reasoning behind this is liquid aminos have no added salt or preservatives, unlike traditional soy sauce. I use Bragg’s Liquid Aminos. There’s a hint of red pepper flakes for a little heat, which if you follow my recipes you know I tend to do this quite often because I’m a sucker for a sweet hot mix. 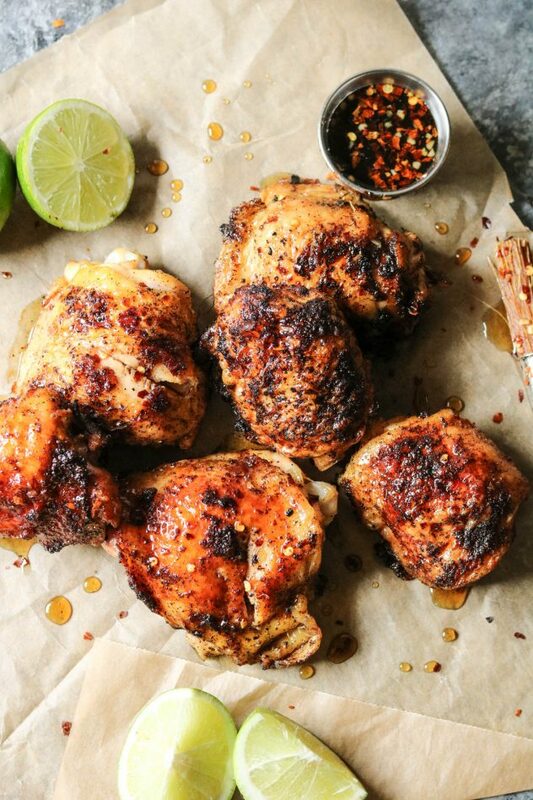 And let’s talk about the spice rub on the thighs. The cardamom is the winner here, which pairs perfectly with citrus flavors like lime. My only word of warning when grilling chicken thighs is that they produce a lot of grease, so be careful. We usually end up cleaning out the bottom of our grill after a few grilling sessions of chicken thighs because the grease tends to pool, causing flare ups, in our small grill. If you have a large grill, or charcoal grill, this probably won’t be an issue. But don’t be discouraged to grill chicken thighs, they are so good when grilled, especially when the skin soaks up that grill flavor. Combine the dry seasonings for the chicken. Rub the seasoning all over each chicken thigh. Preheat grill over medium heat. Add thighs to grill and cook until done. While the chicken is grilling, combine the sauce ingredients in a small bowl and whisk to combine. 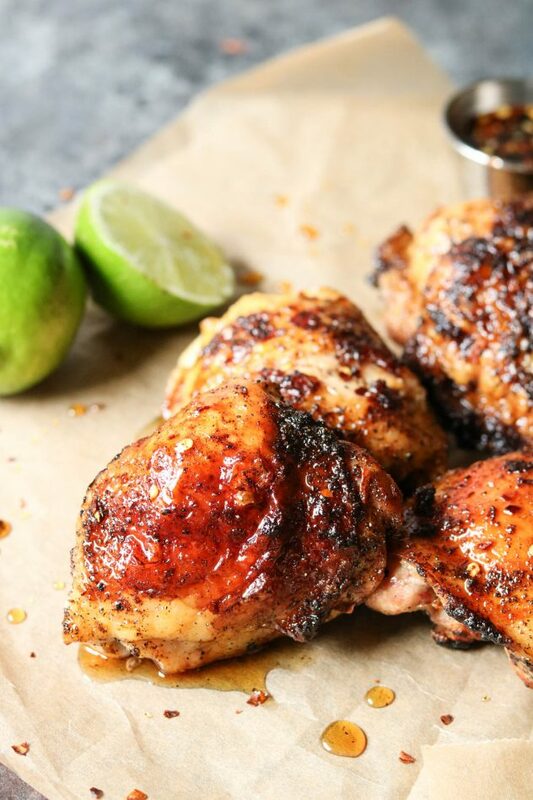 Once the chicken is finished cooking, let rest for 3 minutes, then brush honey lime sauce onto each thigh.